Spend your Christmas the Filipino way and expect a gratifying and lovely experience like no other. The Christmas season in the Philippine is one of the longest celebrations in the world. The holiday season starts and ends with the “ber” months from September to December. Disc jockeys play Christmas songs starting on the crack of dawn of September 1. News programs lead a countdown on the number of days before Christmas. Radio and TV advertisements hint about the joyous holiday season. Malls are adorned with Christmas trimmings and brilliant golden lights. Businesses usher the season with sales promo and vending of Christmas wares and giveaways. Cash registers start to get busy. Some companies give employees an early Christmas Bonus to shop while prices are low and to avoid the holiday rush. After November 1, All Saint’s Day, Filipinos unpack and hung the Christmas ornaments. They set the Christmas tree beckoning that Christmas is in the air. Households are abuzz with the viands that will grace the table come Christmas day. The Christmas list fills up with names of recipients of a love gift from someone who cares. There are customs and traditions to make the Christmas in the Philippines more meaningful. A representation of the Nativity Scene, mini-statues symbolize the baby Jesus, Joseph, Mary, the three kings, shepherds, and animals. This is what Christmas is all about the humble birth of Jesus in a stable. 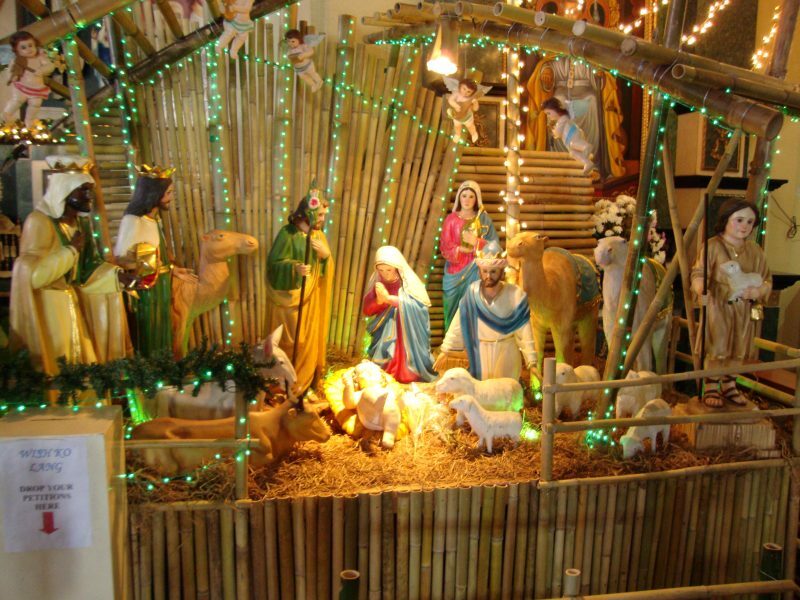 The Belen is a popular display in schools, Catholic churches, and houses. Wow at the wondrous parols, or Christmas lanterns, hung on commercial establishments, schools, and offices. Uniquely made in the Philippines from colorful paper, bamboos, and Filipino ingenuity. The makers provided a twist, nowadays they make it from capiz, lights and comes in various shapes and designs. See the giant parols in action in Pampanga this December 17 a stunningly beautiful event your eyes will pop in amazement. Christmas is for children it is their time to belt out Christmas songs. Their accompaniment are cans they use as drums, tambourine from bottle caps, and their innocent voices. You’ll be amused by their voice talent plus some dance moves for some loose change. A Filipino version of the secret Santa, popular with employees and students that lasts for a few weeks. Lots are secretly drawn to determine the parent, giver, and baby, receiver. The parent takes care of the baby by giving small gifts. The unknown giver is out during the Christmas party with exchange gift-giving among the participants. Every year, it is customary for the family to watch spectacular dancing lights show installed in different public places. From the first week of December onwards, organizers never fail to amaze revelers. See a display of glittering lights gyrating to the beat of the music. Scoot over to the Ayala Triangle in Makati City and get lost in the wonderland. Your jaw will drop at the giant Christmas tree with festive ornaments at the Araneta Center in Quezon City. Or Misa de Gallo is one of the oldest Filipino Christmas traditions. The faithful wake up early morning to flock the Catholic church for a 1-hour service at 4:00 am. This is a 9-day vow starting from December 16 and culminates on December 24 with a midnight mass. The Simbang Gabi is a way of thanking the Lord for the blessings, worship, and fulfill one’s wish to fruition. Filipinos believe completing the 9-days church service will make their Christmas wish happen. After the Simbang Gabi feast on kakanins, native rice delicacies, from stall vendors outside the church. Popular among foodies are puto bumbong and bibingka pair this with salabat, ginger drink, and you’re on your way to a good start of the morning. If your tummy craves for more satisfy your palate with kutsinta, suman, sapin-sapin and more delicious goodies. The Christmas season caps with the Noche Buena, the good night, which is all about food. If you are attending one expect to meet someone who isn’t a relative. Tito’s and ninangs that your host grew up with. Of course, the center of attention is the Agape table filled with all mouth-watering food that you can ever imagine. And there’s the star of the feast – Lechon. The crunchiness of the skin will make you drool with every bite add the soft, juicy meat. There will be exchanging of gifts and handing out of angpao, red envelope, with money to kids. We hope that you have a great Christmas season in the Philippines with your loved ones. Maligayang Pasko!